Change for anyone can be difficult. But imagine that you have lived in your family home for over 30 years, raised your children in the same neighborhood, and retired there with your late husband. This is where you know your mailman, butcher, florist, and neighbors by their first names. You need to downsize, sell a home, and decide what to keep. This is no small task. It can be daunting. And we never underestimate the stress and impact this has on a person moving into one of our assisted living communities. We’ve got it covered every step of the way—their care, comfort, and assistance. As your loved one gets settled into their new apartment, every community carefully orchestrates the introduction of a new resident. From scheduling the move into their new apartment, to meeting staff, introducing them to other residents, and integrating them into the community and activities; we want their first impression of the community to be positive and engaging. The community holds an all-employee staff meeting at every shift change, every day. During this meeting, details about the new residents are shared with the staff so they can become familiar with who is moving in. This is a big event, and we don’t take it lightly. Every director will make a special point to introduce themselves and get to know the new resident as soon as possible to make them feel welcome. Even when we put our best foot forward, some new residents are resistant and may complain that they want to move back home. This is normal behavior, particularly if your parent is suffering from dementia. They may be confused and anxious due to memory loss. This is a significant life change for them. Keep a positive attitude and use encouraging language when you are together. This may be hard for you and difficult to hear that your parent is unhappy. But if they can no longer live on their own this is the best solution to keep them healthy, safe, and in the company of others. Give them some time to adjust and know that you are doing the right thing. Patience is key. Studies have shown that family contact is one of the strongest predictors of satisfaction and happiness. Family involvement has been linked to lower mortality, less hospitalization, and earlier hospital discharge in a study of those living in long-term care. Staff will be particularly careful to introduce our new residents to other residents who they think are like-minded. They will ensure that they do not sit alone at meals. Our staff is diligent to make sure residents are up in the morning, groomed, and ready for breakfast with a table to sit at. We know that making a new friend can positively impact their attitude toward a community. Our Life Enrichment Director plays a key role to encourage new residents to attend activities. Walking into a room of new faces can be intimidating, often caregivers will accompany new residents to activities to help them find their way around the community. Not everyone is a social butterfly, but everyone wants to feel welcome and included. Activities are a great way for new residents to meet their neighbors in a comfortable setting and get involved in hobbies, art, games, or exercise that they are interested in. Activities are also helpful to set up a daily routine. Our Health Services Director monitors the health and well-being of all our residents carefully. If a new resident is not adjusting well to the move, they will make sure there isn’t any underlying health issue or depression that might be causing them discomfort. Anyone might react negatively to a new situation if they don’t feel well or are in pain. We will make sure that they get extra staff attention, feel supported, and health issues are treated appropriately. There are many opportunities to keep some things the same in their lives. For example, while at Aegis Living your parent can keep their same doctor. Many Aegis Living communities offer a visiting medical provider for convenience, but they are welcome to keep a physician who they are familiar with. We offer transportation to and from appointments. Also, the community is their home. They are welcome to have visitors—lunch with old friends, play dates with the grandchildren, or dinner with their children. Familiar plans, tasks, and company can help them better adjust to their new surroundings. 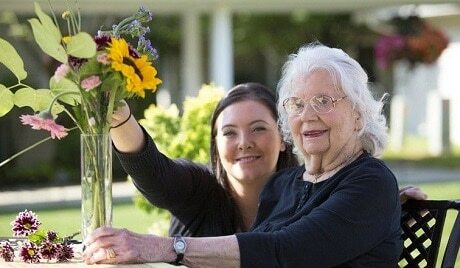 To make your parent happy in their new home, we will make every effort to accommodate their adjustment. If you are concerned, speak with the Health Services Director or General Manager to see if there are things that can be done to make them more comfortable. The Chef can make a special family recipe, the Life Enrichment Director can add their favorite hobby to the activities calendar, the community can play their favorite movie in the private theater, or your family can host a brunch in the private dining room. We know that small things can have a significant impact on their happiness as they settle into their new home.